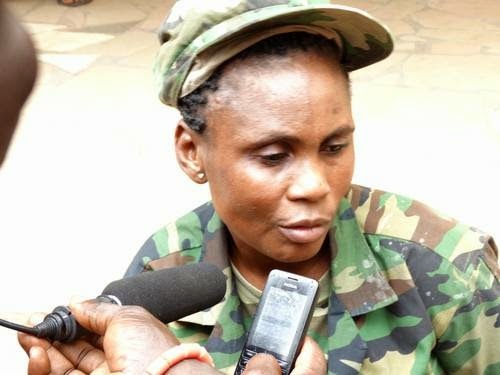 The Nigeria Police Force (NPF), Ondo State Command, have re-arrested a woman, who had been parading herself as an army officer in order to gain favors from the public and border officials. Jemila Suleiman, who had been using the pseudonym Angela Tonye Omieh had been previously arrested on the 17th of April 2014, whilst dressed in complete military regalia and attempting to pass through a military check point in Akure, capital of Ondo State. Police produced the then-detained Suleiman at a press briefing on the 13th of May 2014, where she informed journalists that she had attended the Nigeria Army depot in Zaria, Kaduna State but dropped out after incurring injuries. After her initial arrest, Suleiman disappeared from authorities after being granted bail by a judge on grounds of supporting her family. Suleiman said she purchased the military uniforms from the Army depot in Zaria, Kaduna State. She was re-arrested on Wednesday as she attempted to pass through the Igbara-Oke military checkpoint in Ifedore Local Government Area. At a press briefing on Wednesday, Issac Eke, the State Commissioner of Police, informed journalists that interrogations of Suleiman had revealed the location of her real name and residence, Mile 3 Dioba, Port Harcourt, in Rivers State. 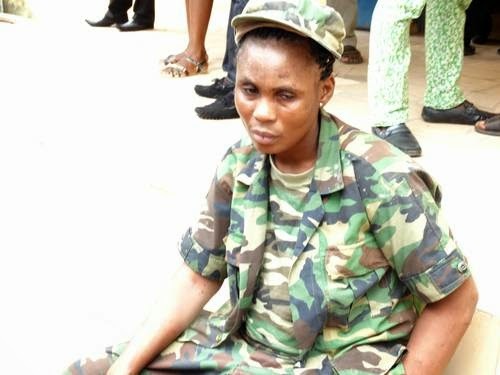 The interrogation had also revealed that she had purchased her new military uniforms at Kantagora market in Abule Egba, Lagos State.